NO TROUBLE COLORED BUBBLES ! Question: How to create the best bubbles with the least amount of effort? 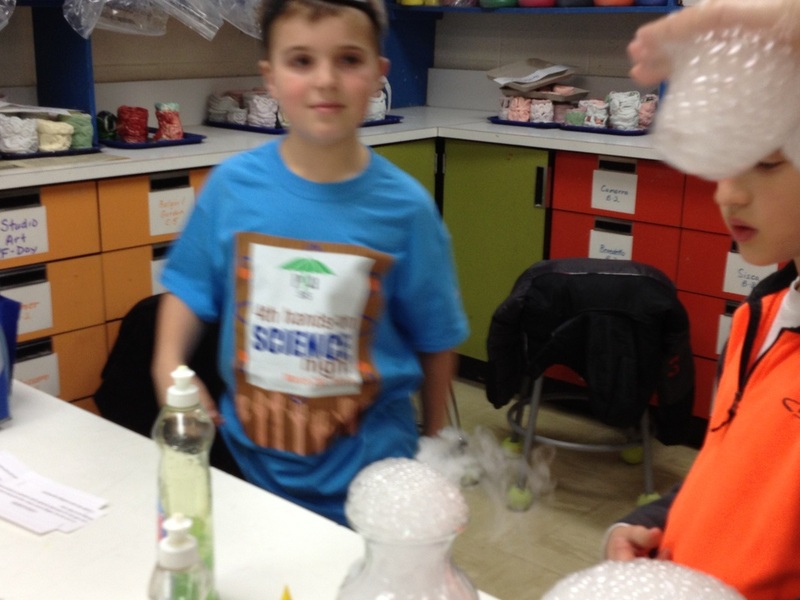 Hypothesis: When we add dry ice to a soapy solution, bubbles will grow quickly in a container and the results will differ depending on the type of container and how the dry ice comes into contact with the soapy solution. Dry Ice is frozen carbon dioxide (CO2). As the carbon dioxide goes directly from a solid to a gas ("sublimation" - at temperatures above -56.4 degrees Centigrade or -69.5 degrees Farenheit) the dry ice will start to "smoke". 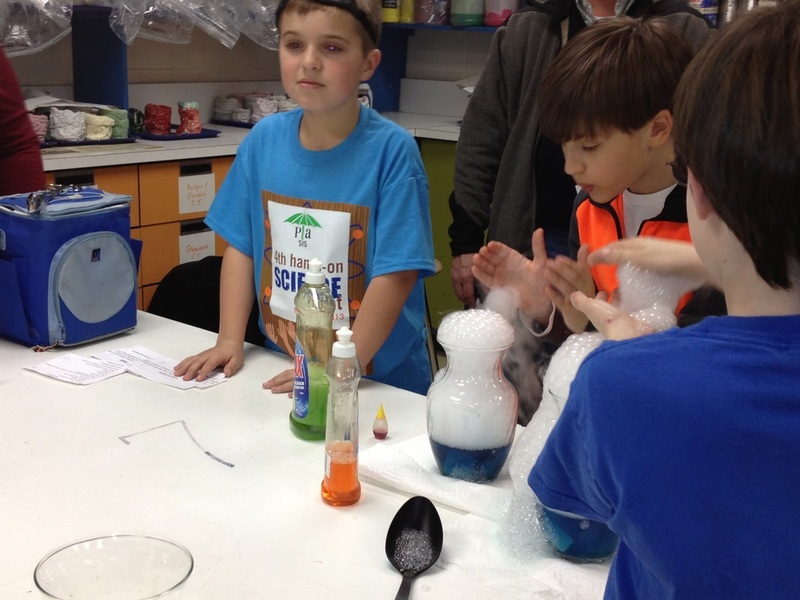 When dry ice comes in contact with the soapy solution, bubbles will form. 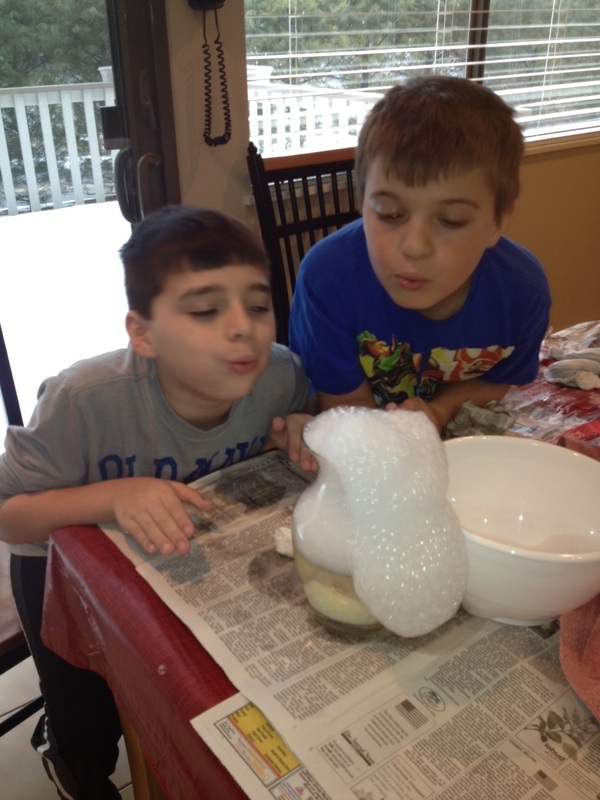 Bubbles blown over dry ice will float on the dense carbon dioxide for awhile. When the bubbles start absorbing more carbon dioxide they will grow heavy and sink because carbon dioxide is heavier than air. 4 Medium size plastic bowls with rim of @1/2 inch edge. 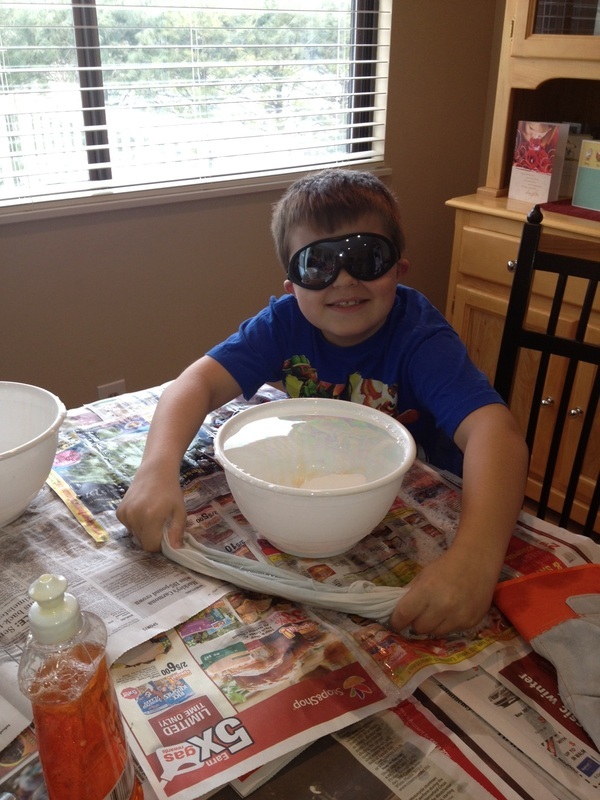 The bubble is the size of this bowl so we will use a large diameter bowl. 1 Medium glass bowl with rim of @ 1/2 inch edge. 1 Medium glass bowl no rim. 6 tall glass vases with no rim. Thin strips of cloth [we used old T-Shirt cut up]. Must be long enough to cover the diameter of the bowl and then some. Dry ice (we used 2 blocks of dry ice about 2 lbs. each which we broke into small chunks). Old towel (for breaking up dry ice). Food coloring (yellow, red, blue) 1 oz. bottles. 2 types laundry detergent (Purex & Surf). 2 types dish detergent (Ajax & K-Mart Brand). 2: Listen to our instructions and please follow our directions. We don't anyone to get hurt. 3: If you are unsure of something, please ask for help. 4: Avoid directly breathing in dry ice vapors. 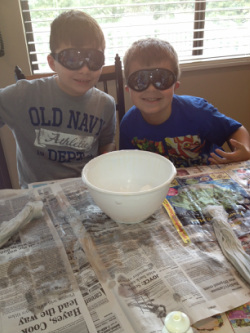 5: Goggles may be used but are not required except for when breaking up dry ice from large block to smaller. 6: If the soapy water and/or bubbles overflow onto the floor, be careful as floor may be slippery. 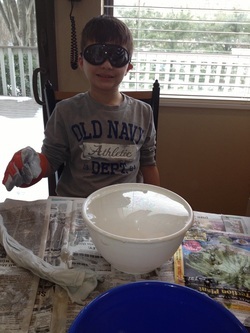 Place dry ice with the tongs and hot water in the bowl. The dry ice will start to sublimate and turn into dry ice fog. The dry ice fog will spill over the side of the bowl. This is okay. Take the soapy cloth strip and run it around the lip of the bowl. This will make the lip of the bowl soapy. Take the strip of cloth and stretch it out horizontally over the bowl. Drag the cloth across the lip of the bowl. Stand back and watch your bubble grow. (NOTE: If the dry ice bubble doesn't start to appear almost immediately, dip the cloth and try again). It may take several tries --- don't give up! 7. Put warm water in glass vase (about 4 inches), squirt soap into vase (either dish or laundry detergent), 2 or 3 drops of food coloring (your choice of color) and carefully drop two ice-cube size pieces of dry ice with the tongs. 8. Stand back and watch the colorful bubbles flow over and over out of the vase onto the table. It is a fun project. 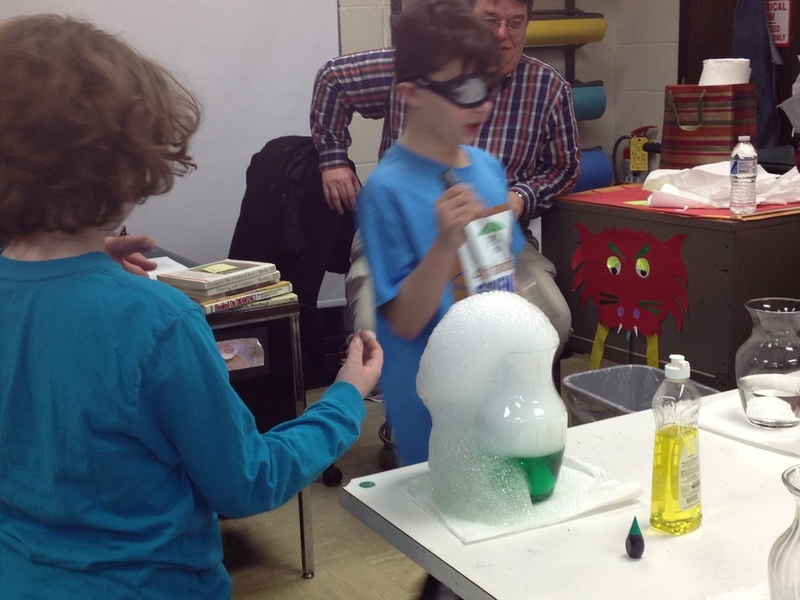 You learn about sublimation while making cool soapy bubbles. We tried various different containers to show which combination of water, soap and dry ice would create the best bubbles with the least effort. What we wanted was success for the participant each time the experiment was done. 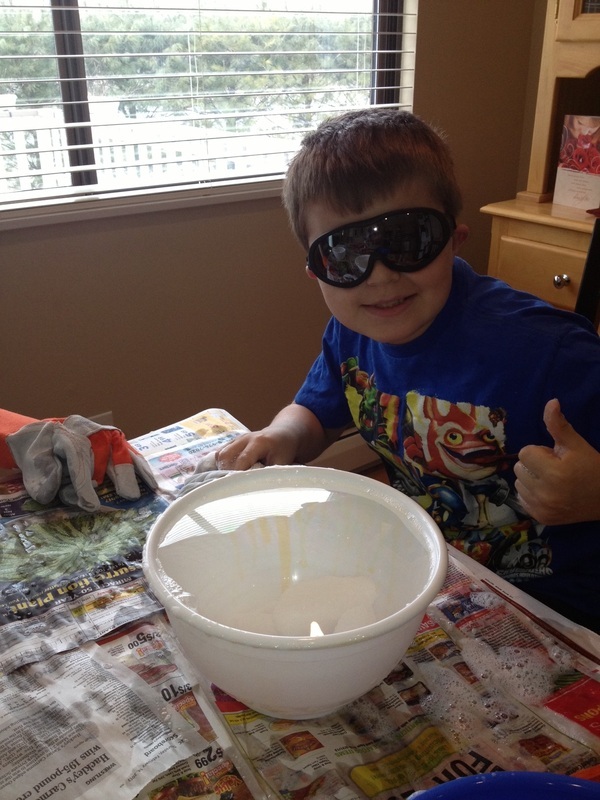 We first put in two medium bowls 3 small chunks of dry ice and warm water. It started to smoke (carbon dioxide fog). 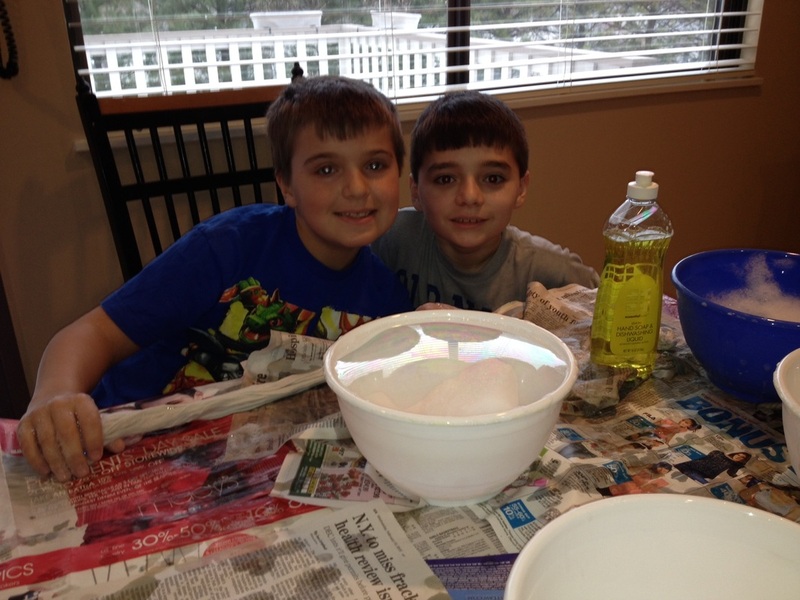 We then coated our rims with soap and carefully dragged our soapy strips across the bowls and a bubble would form. We were not always successful (sometimes our bubbles would immediately pop when we moved the strip from the bowl after the bubble had fully formed) but we kept trying. 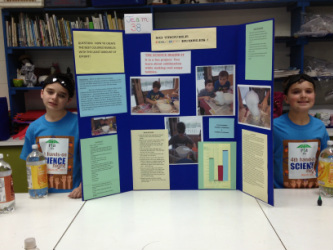 We tried with different soaps and we determined that Ajax dish detergent worked the best. We were successful in forming bubbles approximately 75% of the time. We then tried using two glass bowls --- one with a rim and one without a rim to see if we would have different results. The glass bowl with the rim was successful approximately 50% of the time in forming a bubble which lasted a few minutes. We determined that the glass bowl has small ridges near the top which may have caused our bubbles to immediately pop when we moved the strip from the bowl after the bubble had fully formed. The glass bowl without the rim was not at all successful in forming a bubble. We then tried to see what would happen if the container had a different shape so we used tall glass vases. 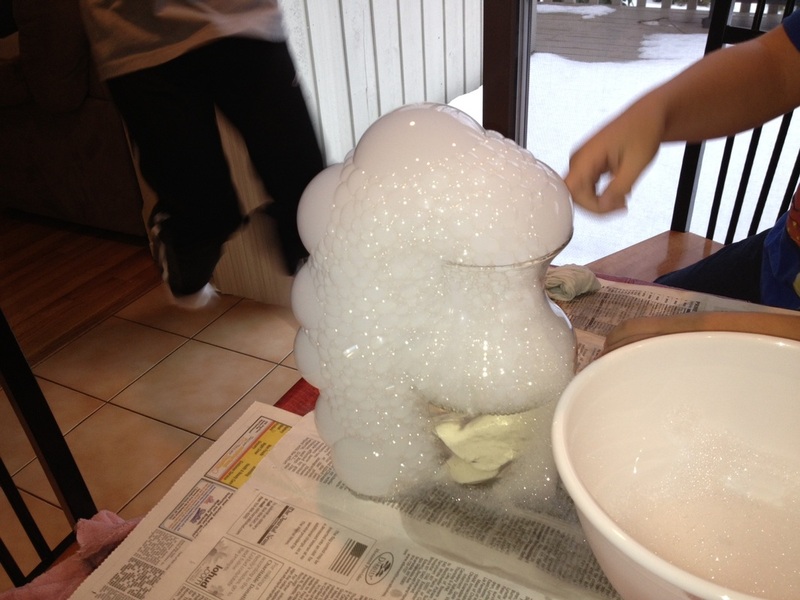 We had warm water and soap in the vase and then we carefully put dry ice cubes into the vase. The reaction was immediate. Each time we did this the result was the same. 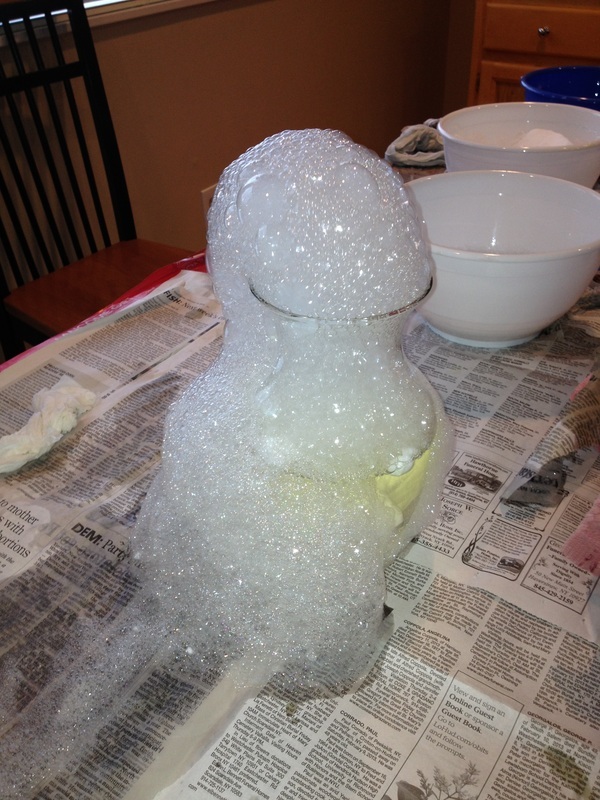 Mounds upon mounds of bubbles consistently flowing out of the vase. 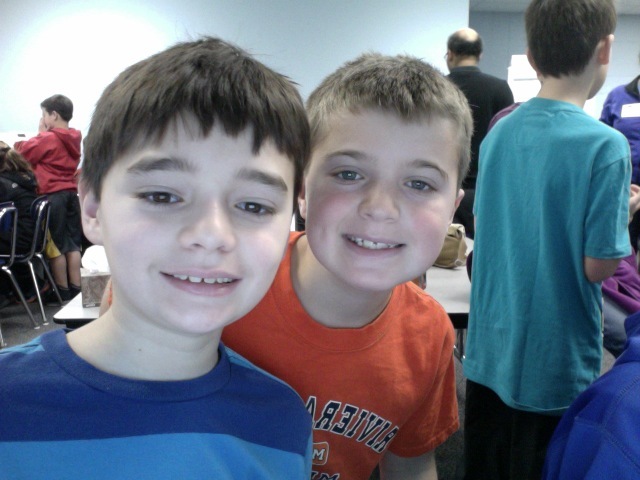 We had 100% success and most of all, it was fun! We then tried adding a small squirt of food coloring (yellow) and we had yellowish bubbles. The result was the same with red food coloring (red bubbles) and green food coloring (greenish bubbles). Based on our testing, we decided that using a glass vase with soapy water, 2-3 small cubes of dry ice and food coloring created the most visual and enjoyable experiment. Matthew is 10 years of age. He loves learning new things and working with his buddies. Matthew is 10 years of age. He always enjoys new challenges and being creative.